Discount lasts for 5 days. Not just an MP4 to MP3 converter, it can also get MP3 music from a vast amount of video and audio formats. 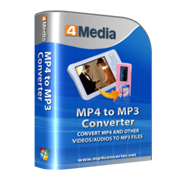 4Media MP4 to MP3 converter can extract MP3 from MP4, MPEG-1, MPEG-2, MPEG-4, WMV, AVI, 3GPP, 3G2, MOV, RM, RMVB, DV, H.264/AVC video files and convert MP3 from various audio formats including: WAV, WMA, AAC, AC3, AIFF, AIF, CDA, FLAC, MPA and M4A. 4Media MP4 to MP3 converter outputs MP3 music compatible with Zune, iPod shuffle, iPod nano, iRiver PMP-100, Creative Zen Vision, and suchlike portable MP4/MP3 players. Compressing output files to any size with the Bitrate calculator, converting pointed segment to MP3, decoding CD, and adjusting various other adjustable parameters are all available. Free try this MP4 to MP3 Converter now! Almost all regular video formats and even HD formats can be converted to MP3, e.g. 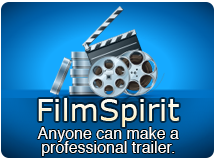 convert AVI, MP4, MPEG-1, MPEG-2, WMV, 3GPP, 3GPP2, MOV, RM, RMVB, H.264/AVC, MPEG-4 to MP3. Convert a wide range of audio formats like WAV, WMA, AAC, AC3, AIFF, AIF, CDA, FLAC, MPA and M4A to MP3. Queue up all the files you want to convert and 4Media MP4 to MP3 converter will automatically complete the MP4, AVI, MPEG4, M4A to MP3 and such conversions one by one. 4Media MP4 to MP3 converter will auto detects dual core CPU type to give you the fastest conversion speeds. Compress a large file to the size you want with the Bitrate Calculator, or split a large file into several small segments to better fit your media players. Set start time and duration to get only the desired segment with this MP4 to MP3 converter. Output various MP3 files with different settings from a single source. Edit MP3 title, author, album, genre, composer, year and other ID3 tag information to help you categorize your MP3s. You have the option to run the program in background, and then automatically execute the task complete actions. The whole MP4 to MP3 conversion is as easy as pie: just load source file and convert! Improved layout style for logs.